KIEV, March 21. /TASS/. Ukraine’s presidential hopeful, showman Vladimir Zelensky, has spoken in favor of a free use of the Russian language along with other languages, saying oppressing the Russian language in Ukraine is inadmissible. "There must be no pressure on their languages, pressure must not be put on the Russian language. My children speak Ukrainian. 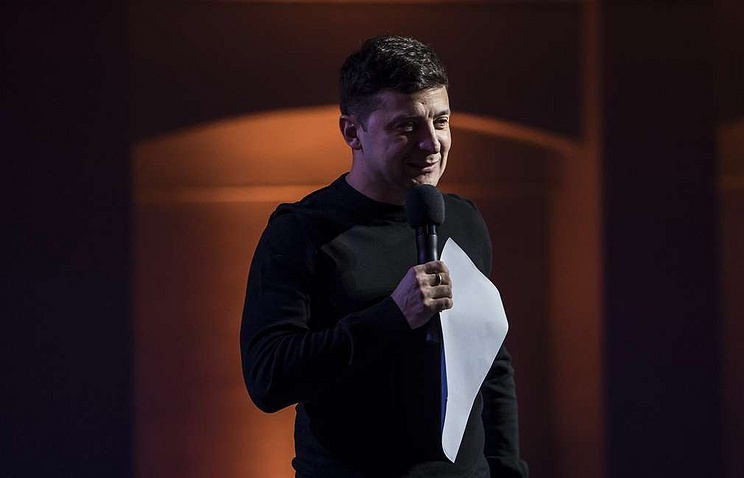 They know the Russian language, and now they start translating from Ukrainian into Russian when they speak with me," ‘Ukrainian News’ quoted Zelensky as saying. Under the Ukrainian Constitution, Ukrainian is the state language, however, the authorities must also guarantee a free use of other languages, the presidential hopeful said. The Ukrainian presidential election is scheduled to take place on March 31. According to opinion polls, comic Vladimir Zelensky leads the race, followed by leader of the Batkivshchina (or Fatherland) party Yulia Timoshenko and incumbent President Pyotr Poroshenko. October 4 last year, following difficult discussions, the Ukrainian parliament passed the bill on ensuring Ukrainian as the state language in its first reading. It began considering the bill in its second reading on February 28. The law drew a lot of public attention both home and abroad. Particularly, Council of Europe Commissioner for Human Rights Dunja Mijatovic called on the Rada to stop considering the bill during the election campaign period and ensure that national minorities have their say in the document. Deputy Head of the Hungarian community in Kiev Tibor Tompa expressed concerns that if the law is adopted, interethnic relations in Ukraine might become strained. Russian Foreign Minister Sergey Lavrov reported that Moscow was alarmed at the violations of national minorities’ language and education rights carried out by Kiev and, in this regard, the top diplomat said that he had appealed to the EU, The Council of Europe, the OSCE and NATO. Chairman of the political council of Ukraine’s Opposition Platform - For Life party Viktor Medvedchuk, this party’s presidential hopeful Yuri Boiko and a number of other politicians have also publicly declared their opposition to the law.